on the South Island of New Zealand. Setting out from Oamaru, we drive north briefly on State Highway 1 before heading inland at Pukeuri towards the Waitaki Valley. It's a picturesque drive along the southern banks of the Waitaki River, a rich fishing ground and recreational region. We arrive in Kurow for a brief pit stop then continue skirting the Waitaki River until we reach the first dam on the river. The Waitaki Dam was the first constructed along the Waitaki River during the early 1930's and was the last one in New Zealand to be constructed without using modern machinery (ie picks and shovels were used for excavation). We continue on to the next dam, the newest of the three dams on the Waitaki River - Aviemore Dam (completed in 1968). This dam can be driven across so we pass over to drive the Canterbury side of the lake to Waitangi Reserve which is an ever popular holiday camping spot for Cantabrians and Southerners during the summer months in New Zealand. Next is a crossing over of the Benmore Dam a massive earth dam - New Zealand's largest, and back out to Highway 83 to continue on towards the Mackenzie Basin. We make a beeline for Lake Tekapo and arrive to find a ton of tourists flocking to see the most popular two sights (besides the Lake) the historic stone Church of the Good Shepherd and the Sheep Dog Statue - a monument recognising the hard working border collie. It was too busy for us, so after a quick bite of lunch and a yummy Tip Top icecream we headed back towards Mt Cook - New Zealand's highest mountain. 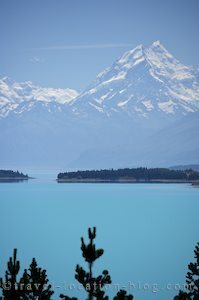 We didn't quite have time to drive all the way to the Mt Cook Village but we enjoyed the stunning views of the snowcapped mountain and glacier fed Lake Pukaki before heading back towards Oamaru. It was a long drive but on a beautiful sunny summer day it was a rewarding drive.